What are Foster Care Providers? 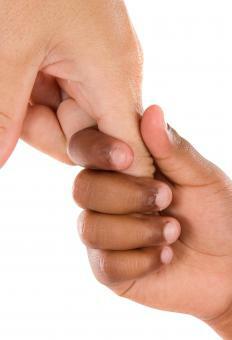 A foster parent takes care of a child until an adoption takes place. Foster care providers are people who give temporary care to children who can’t stay at their normal homes for some reason. In many cases, these children may come from difficult home environments or have parents who have suffered some kind of major setback. The requirements for foster care providers can vary significantly from one place to another, with most governments requiring some kind of licensing process, which may include classes and living environment inspections. Sometimes, foster care providers eventually become adoptive parents, but more often, the arrangement is very temporary. The government will generally provide money on a monthly basis to use for taking care of the children. The reasons why children need foster care providers are usually related to a difficult home life in some way. For example, some of the children may come from abusive homes or homes where parents have substance abuse problems. There are also children whose parents are suffering from an illness or parents who can’t afford to provide a reasonably safe home environment because of financial setbacks. Many of these children may have various emotional problems, and some of them may be very upset about getting separated from their parents. Being able to handle children in a fragile state is sometimes an important qualification for foster care providers. In some cases, providers may even receive special training for how to deal with children in these situations. Most areas have certain qualifications they require for foster care providers. For example, some place may require a clean criminal record or at least proof of a very stable living environment. The foster parent will also generally be required to act in a way that promotes an eventual reunification between child and parent, which might mean that any kind of demonization of the parent would be discouraged, among other things. Sometimes foster care providers are actually relatives of the children they're caring for. Many relatives will actually go through the licensing process just to help a family member out and give the most comfortable possible environment for the child. It’s very common for governments to favor the idea of letting relatives take on these duties whenever possible because it may be less disruptive. There are many cases where the situation can gradually evolve to the point where the foster parents adopt the children in their temporary care. This can happen in cases where reunification between children and parents proves impossible and the foster care provider develops a close relationship with the children in the meantime. How do I Report Suspected Foster Care Abuse? What does a Foster Care Agency do?